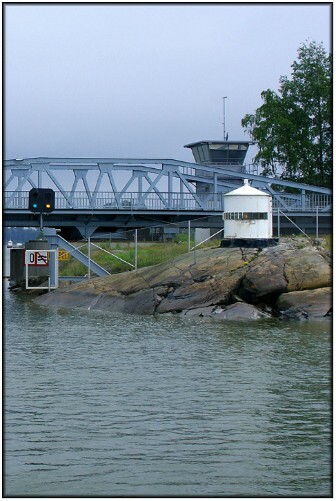 This small beacon is situated on the south side of the Hastnas Channel, part of a complex system of inland waterways that threads its way through the numerous islands that surround the main harbour of Helsinki. I'm not entirely certain as to its exact purpose but I think that it is simply there to mark the very narrow passage that is crossed at that point by the swing bridge that can be seen in these photographs. It clearly plays no role in controlling traffic passing through the bridge as the bridge itself is equipped with control lights that are clearly visible in the photograph above. Although Trabas in his Online List of Lights gives the name of this light as "Hevossalmi" (and that is the name I have used here), the National Geospatial-Intelligence Agency, Publication 116, give the name as "Hastnas Channel, S. side". Clearly the former name refers to the bridge and the latter to the channel. 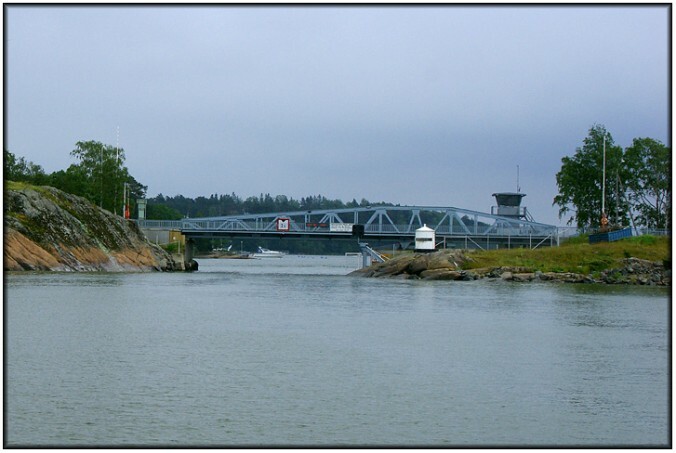 The image below shows a wider view fo the bridge and the light, and gives a better idea of their relative positions.